UGVCL Vidyut Sahayak JA & JE Result 2018 at www.ugvcl.com/careers. UGVCL Junior Assistant Exam Answer Key 2018: Uttar Gujarat Vij Company Limited – UGVCL had Conducted Junior Assistant & Engineer Online Exam on 13th October, 14th October and 15th October 2018. Lots of Applicant Appeared in this Examination and Now Searching for UGVCL JA Answer Key 2018. Official Answer Key / Paper Solutions of UGVCL Junior Assistant Exam PDF Uploaded on website www.ugvcl.com/careers check here. Update (3rd October 2018) : UGVCL Released Call Letter Notification for Vidyut Sahayak Junior Assistant and Junior Engineer Recruitment Notification 2018. Applicant Can Download Admit Card of UGVCL Online Examination from 3rd October 2018. Date of Examination is Given Below. UGVCL Recruitment 2018 | Apply Online for 292 Vidyut Sahayak (Junior Assistant -JA) & Vidyut Sahayak (Junior Electrical Engineer/Civil -JE) Vacancies at www.ugvcl.com/Careers. Great News for all the contenders who are looking for the government jobs in UGVCL. 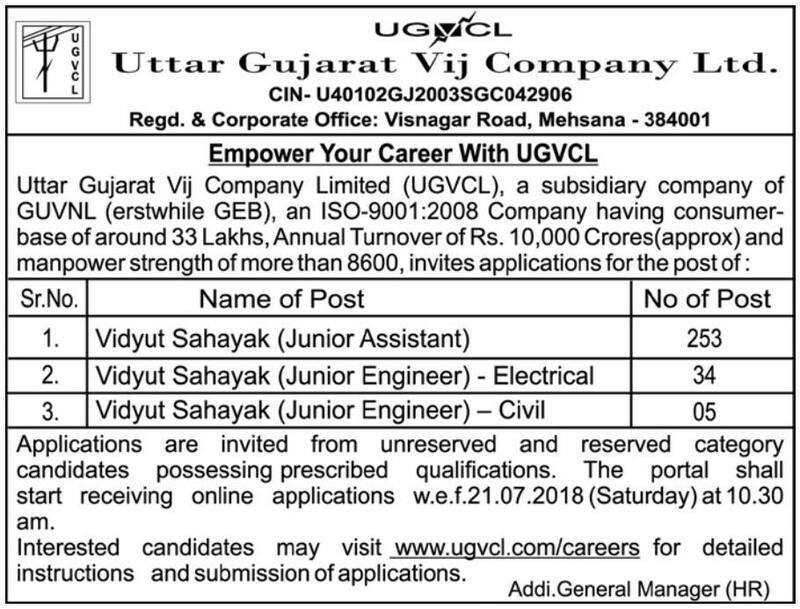 Uttar Gujarat Vij Company Limited has circulated a UGVCL Bharti 2018 notice which states that the department is in need for the educated & well- skilled contenders for the blank posts in the Uttar Gujarat. The department has released the UGVCL VSJA & VSJE Recruitment 2018. 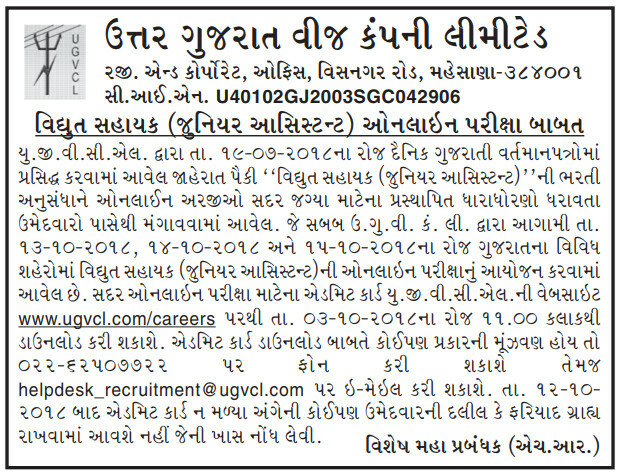 Willing and enthusiastic aspirants can read this entire post & submit the application form at the official link of the Uttar Gujarat Vij Company Limited department that is “www.ugvcl.com”. Job extracts can read this entire post & collect all the vital details from the lower parts of the post. You can bookmark our website www.govtjobbuzz.com if they want to get the latest updates regularly. Uttar Gujarat Vij Company Limited has depicted an employment notification for all the job searchers who are seekers for the Uttar Gujarat Vij Company Limited Jobs 2018. The official job notice states that the UGVCL department is going to hire the eligible contenders for the 253 vacant posts of VSJA-Vidyut Sahayak Junior Assistant Posts in the department. The Uttar Gujarat Vij Company Limited will accept the registration forms via online mode. Willing aspirants can visit the official web portal and submit the application form before the ending date. The Starting date to apply for the job is 21st July 2018. Individuals who will satisfy the eligibility needs will be allowed to apply for the UGVCL Recruitment 2018. Interested applicants can scroll down this full web page and collect all the vital details which are available in this post. Official website of ugvcl call letter is closed. Uttar Gujarat Vij Company Limited is a subsidiary of GUVNL. For 2010-11 the co. has received National Gold Shield for marvellous performance in power distribution. It’s the leading electricity co. of Gujarat for power distribution which was incorporated in the year 2003. It is included in electricity sub-transmission distribution and retail supply in Gujarat /outside of state too. 2. Upper age relaxation is applicable to the reserved candidates as per the govt. rules and regulations. Selection Method: If the aspirants want to get this wonderful job, then they have to clear the examination and Interview round which is going to be conducted by Uttar Gujarat Vij Company Limited. Salary Scale: Selected contenders will be regarded with the great amount of monthly salary as per the govt. norms. 1. Visit the official web portal of the ugvcl career department i.e. “www.ugvcl.com”.2. Go to the Advertisement Zone. WHEN THE UGVCL Vidyut Sahayak (Jr. Assistant) RESULT WILL COME. PLEASE PROVIDE Information regarding it.